Welcome back to another week of Fantasy basketball. We’ve now entered the 2018 portion of the 2017-18 season, meaning it’s time to really start working that wire as the second half begins. This week, Derrick Rose (ankle) hinted that he may finally soon return to action for Cleveland; Lonzo Ball (shoulder) was activated Friday, shooting it well en route to an 11-point performance; and Thon’s younger brother, Matur Maker, will skip college and enter the 2018 NBA Draft. 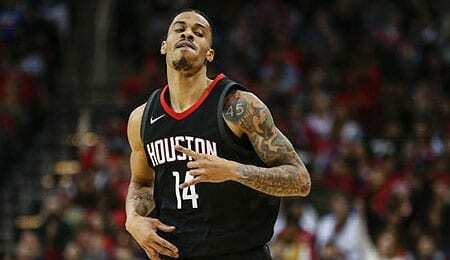 Gerald Green, SG/SF, Houston Rockets (ESPN: 24.7 per cent; CBS: 29 per cent): Talk about an amazing comeback story! Out of the league a week ago, Green signed with Houston and suddenly found himself as the sixth man (with a guaranteed contract for the rest of the season) in no time. Since James Harden (hamstring) got hurt, Green has exploded for an average of 28 points over the last two games. The Beard could be out another six weeks, so Green needs to be added pronto. Green provides instant offense off the bench and the veteran swingman and Houston native (this is his second tour of duty with the Rockets) is known for his periodic phenomenal shooting performances, but since returning to the NBA, it’s like he can’t miss. He’s drained 54.9 per cent from the field including 18-for-31 over the last two games. As early as Green’s second game back (see video below), it was clear he returned on a mission. Mario Chalmers, PG, Memphis Grizzlies (ESPN: 0.9 per cent; CBS: 5 per cent): With Mike Conley still out and now Andrew Harrison sidelined as well, Chalmers once again has value. Chalmers has played at least 25 minutes in each of the last two games, scoring double digits in each, while generally shooting much better lately (11-for-22 in last three). In his return to the NBA this season, he isn’t getting quite as many touches, but is jacking up more treys. Yes, Chalmers is prone to occasional poor decision making, which is why the No. 34 pick in the 2008 draft has had trouble sticking as a starter when he’s actually had to run the offense (as opposed to be the starting PG on a LeBron James-led attack). Still, injuries are necessitating that Chalmers plays near starter minutes now, so grab him while he has this opportunity. Dwight Powell, PF/C, Dallas Mavericks (ESPN: 2.7 per cent; CBS: 5 per cent): Powell is playing big minutes off the bench in the last couple of games, and has been producing, scoring at least a dozen points in four of the last five games. His touches are up lately and his shooting accuracy has gotten better every season. Powell seems to be establishing himself as a key component in the Dallas rebuilding program — especially given the lack of effective options around him. Jump on this train now, especially in dynasty formats. Mario Hezonja, SG, Orlando Magic (ESPN: 1.5 per cent; CBS: 9 per cent): This is mostly a DFS recommendation, on the chance that Jonathan Simmons (back) has to sit on Saturday, but the fact is Hezonja opened some eyes on Wednesday when he scored 14 points with nine rebounds, two treys and two assists in 28 minutes. Before this game, Hezonja had been in a slump from downtown, so if he shakes that and starts seeing PT, we might start seeing more good games like this. It’s been a couple of years since he was Fantasy worthy, and after we last recommended him, he justified the pick with more PT in March and then a huge three-point performance in April. Wayne Ellington, SG, Miami Heat (ESPN: 5 per cent; CBS: 19 per cent): Another two-guard from the Sunshine State, Ellington has seen a big uptick in minutes lately and has responded nicely, especially on Friday when he went off for a team-high 24 points while nailing six treys with four boards and a steal. He’s been used exclusively off the bench this season, yet is averaging a career high seven three-point attempts per game. On Friday, 16 of his 19 shots were from downtown, matching the season high for attempts by a bench player. This Heat squad doesn’t really rely on any single player night in, night out, so Ellington has a chance to go off like this from time to time. Terry Rozier, PG, Boston Celtics (ESPN: 20.9 per cent; CBS: 39 per cent): Considering his recent production (six straight games with at least 13 points), it’s a little surprising that Rozier isn’t more highly owned. His touches are up lately, and after a better rebounding performance in December, he’s been incredible early on in January (13 boards in two games). Rozier is a career backup, but just keeps getting better every season, and he’s still young enough to have plenty of upside. How good are the Celtics? They can have their frontcourt mostly shut down as it was on Friday, yet get a combined 32 points from two backcourt bench players in Rozier and Marcus Smart and beat a good Timberwolves team. Delon Wright, PG, Toronto Raptors (ESPN: 6 per cent; CBS: 19 per cent): Wright has been getting a bit more PT lately (games of 29 and 30 minutes in the last week), and has value in deeper formats. He’s shown the ability to put up impressive numbers off the bench, on Wednesday scoring 25 points with 13 boards, five assists, four treys, four steals and a block, and then following that up Friday with 12 points and seven boards. Almost exclusively a bench player throughout his career, he’s getting a chance to step up this season and become a big part of the Raptors’ depth. Despite Rose being at the top of the depth chart, Jennings — who looks healthy this preseason — is still projected to have an increase in overall production compared to his last two seasons, although it would be nice to see some consistency (he was 0-for-6 on Wednesday after a solid effort on the weekend). This season, McDermott may see time at both the three and four and he earned his first career start on Thursday. We’re starting to see his offensive skills, with back-to-back double digit scoring games earlier this week (including a five-trey show on Tuesday) and he’s being rewarded with more PT (26.5 MPG over the last two). The fact that Bulls won the game that McBuckets started bodes well for more. Grab him now.